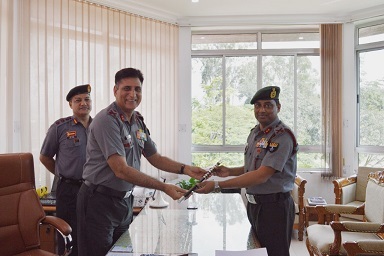 The outgoing Inspector General of Assam Rifles (South) Major General Virendra Singh handed over the baton and command of IGAR (South) to Major Gen KP Singh on Saturday, according to a press release. Major General Virendra Singh’s nearly two years tenure saw major changes in the trajectory of Manipur’s destiny. Beginning with the 139 days economic blockade in late 2016, Manipur since then has slowly but inexorably moved towards a more peaceful existence, says PRO, Assam Rifles(South) in a release on Saturday. The General contributed towards the same by effectively tackling insurgency and successfully working towards the identity of IGAR (South) as true ‘Friends of Manipur’. He was also instrumental in executing a large number of substantial Civic Action Projects across the state which in turn had a positive impact towards overall development of the society, especially the remote areas. With his operational vision, he executed advance deployment of troops and synergised operations resulting in enhanced security within the State and along Indo-Myanmar border, it added. The General ensured synergy with political and civil hierarchy, orchestrated perception management conceptualised comprehensive development of Manipur by addressing core issues through people friendly initiatives while simultaneously fine tuning administrative setup of men under his command to further improve their quality of life. The General was bid farewell by the entire Mantripukri garrison in an emotionally charged atmosphere where each one present wished him continued success in future endeavours as well,the release said. General KP Singh was posted at IGAR (East) in Silchar prior to taking over the present appointment. The General also has the rare distinction of commanding the famous Siachin Brigade, the highest battlefield in the world. A highly qualified and professionally competent officer with vast counter insurgency experience, the General Officer has been handpicked for this highly challenging and prestigious assignment. Appealing to the people of Manipur to continue to extend their love and support to the security forces, the new Inspector General has urged the State government officials, Judiciary and members of the media for their cooperation, empathy and constructive criticism. He vowed to do everything possible in his capacity to create a conducive environment for the growth of the Manipuri people, it added.